We are pleased to announce the launch of Power Manager Pro 4.3.3. This release fixes bugs. 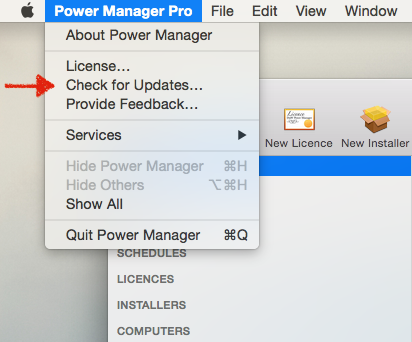 Power Manager Pro will automatically check for updates every so often, so there is nothing to do. The update will automatically be offered to you during the next few weeks. If you want to update to the latest Power Manager now, use the Check for Updates… menu item in the Power Manager Pro menu. Bug: Fixed crashing bug that could occur when disconnected from a client. Change: Removed Preferences and client installer interface; no longer required. This article was posted in PMPRO4, and Power Manager and tagged launch.